Q: Where did this Scapular come from and is this approved by the Catholic Church? A: The Scapular was shown in a vision on August 23, 1878 to the stigmatist and mystic Marie-Julie Jahenny (1850-1941). The Scapular was shown to her resting on the Immaculate Heart of Mary. Marie-Julie Jahenny was born on Coyault, but lived in La Fraudais, just a short distance north of Blain in Brittany France. She was approved about three years before then by her local bishop in 1875, Bishop Fournier, bishop of Nantes. A mystic does not need approval from the Vatican, a local bishop's approval is recognised as official Church approval. Therefore, we can safely wear the Purple Scapular as it originated from a supernatural revelation given by an approved mystic. Q: What's the story of the Scapular? Why did Heaven reveal this relatively new scapular to the world? A: It is Scapular was specially designed by Our Lord and Our Lady themselves, Our Lady said: "... for a long time my Son and I have had the desire to make known this scapular of benediction." Q: What are the images / symbols? type of large sponge that has raised ears, like those of balled oats. The three drops of blood will go to join together and fall into a small chalice painted in red, and the chalice is surrounded with a crown of thorns, and there are three little crosses engraved on the front of the chalice. This is the side of the scapular that is on the mantle of the Holy Virgin." "The other side of the scapular represents the Holy Virgin Mary sitting, holding her Adorable Son in her arms, the mouth and the Head of Our Lord rests on the heart of the Holy Virgin. At the lower end of the scapular, at the feet of Our Lord, is an Angel dressed in white, with curly hair, he has a white crown on his head, his belt is red. He has in his hands a white linen with which he wipes the feet of Our Lord. On the side of the Angel, to the right of the scapular, there is engraved a ladder. Behind Our Lord, to the left, the reed of the Passion painted in red, but without a sponge. The tears of the Holy Virgin fall on her breast, to the right, and they stop at the feet of the Angel." "I notice that this scapular hangs by two violet straps that pass over each shoulder, and there are three knots on the left shoulder, and two on the right. (...) The scapular is edged with a red line and the straps are woollen." Q: What do the images mean? "This scapular, my children, it is supposed to be made on my heart, (i.e with humility and devotion to Her Immaculate Heart) because my heart is the emblem of simplicity and humility, and hence, the colour violet. The nails that have pierced the feet and the hands of my Son have been little venerated and are venerable, hence my Son, in His Divine Wisdom, has made that these three nails be painted on the front of the scapular. The red sponge will represent my Divine Son drinking, in a manner, the sins of His children but His Adorable Mouth refuses." ran and I would like this representation to be known. They also think so little of the tears shed by My Mother during My Passion; these tears are found at the feet of the Angel that wipes My Sacred Feet. By this scapular, I would like you to think on the ladder, the reed and the nails of My Passion." Hence, the images of the Angel, the ladders, nails, the reed that held the sponge, etc. are symbolic of this devotion Our Lord wants known, they are not meant to be a literal representation of the Crucifixion scene. Q: Why do the straps have different knots in them? What does that mean? * 5 knots in total: possibly the Five Wounds of Christ. Q: Is there a specific prayer or devotion that needs to be said with this Scapular? I salute You, Jesus crucified, that you grant me life. I salute You with all the joy of the Angels and the Saints in Your descent from the Cross. I salute you with the sadness of Your Mother when you reposed on her heart and on her Immaculate lap. Crux Ave #1: "O, Crux Ave! Spes unica! Et Verbum caro factum est! O Jesus, vanquisher of death, save us!" (O hail to the Cross! Our only hope! And the Word was made flesh.) This must be said in Latin, and you must be "carrying" the Scapular for this prayer. Wearing it would be best! following His example, I love you. By your holy image calm our fears. That I feel only peace and trust! Q: What are the promises and graces attached to the Scapular? A: From a close reading of the text we see there are various promises and graces depending on whether it is simply possessed, displayed, actually worn, or if you simply desire to be clothed with it. Our Lady "This first apparition of this scapular will be a new protection for the times of the chastisements, of the calamities and the famines. 2) Graces and Promises simply by POSSESSING or CARRYING it. ( i.e have it on your person or reverently displayed in your homes). Our Lord: "My children, all souls, all people who possess this scapular, will see their family protected, their home will also be protected, first of all from fires, which will never enter there. This scapular will strike down the ungrateful which blaspheme My Name in the home where it will be displayed. If an impious person enters, they will be so completely struck that their conversion will be close. (Hence, it would be a good idea to get an extra one and frame it for display in your home.) Our Lord still adds that by reminding an obstinate soul about this scapular at the hours of their demise (i.e., death), they will awaken the Faith in it and a firm belief, (grace of conversion). 3) accidents. During chastisements 4) they will be protected. That all those who will have it and think upon it and love it, will be spared the troubles of soul. That those who will carry it will be sheltered from any danger as though they already possessed Heaven. 3) PROTECTING CHURCHES: Displaying it for veneration in a Church will protect that church from impious people and from profanation. Q: Can any priest bless it? A: Yes, any validly ordained Catholic priest may bless it. Like all sacramentals it must be blessed to receive the graces. Q: If I need a new one because my old one has worn out, does the new one need to be blessed again? Unlike the Brown Scapular, there is no confraternity or religious order yet associated with the Purple Scapular. Enrolment in a confraternity means the person is blessed with the graces of the order, e.g. a Brown Scapular is a miniature version of the Carmelite habit so a replacement does not need to be blessed, but since the Purple Scapular is not part of an order yet, and has to be blessed as a regular sacramental, it is better to be on the safe side and have your replacement Purple Scapular blessed. No doubt this Scapular will one day be associated with the religious order that will run the promised Sanctuary of the Cross that will be built on the site of Marie-Julie's cottage as it was descibed in the vision as being a holy habit, but until then, get your new one blessed. Q: If I want to make my own, can I use just any material? A: The directions are specific, so NO, one must keep to the directions regarding the materials and how it is to be made. * The main cloth / rectangular parts must be slightly larger than the palm of the hand. *The straps must be violet purple in colour and made of wool. The left strap must have three knots that go over the shoulder, the right strap two knots. Therefore, you cannot detach the Scapular from its straps either, let's say, to make it part of what is known as "The Five Fold" Scapular, five of the major Scapulars with one set of straps. The Purple Scapular has a unique set of straps, and therefore cannot be detached from them. *The symbols of the Passion on the front must be painted in red, on a dark red flannel panel. The symbols must match the description in the vision. Our Lady: "I desire that the end of the scapular, be of violet, (the background), but I desire that the nails, the chalice, the sponge and the crown be on a piece of dark red flannel." Q: What if the images fade from wear and tear, especially the painted parts? What do I do? A: If they are just faded a bit, like the tiny little crosses on the chalice tend to fade, and you can still make out the image, they are still okay. However, if you are having trouble seeing what all the symbols are, or they are gone entirely, then it's defintely time to repair them or get a new scapular. As a judge of how 'faded' they have to be for this to ensure you still receive the Blessings, I suggest using the rule applied to most sacramentals and priest vestments: for instance, if a set of Rosary beads with a Papal Blessing is missing half its beads, then it's considered not fit for purpose and the blessing is no longer on the set. If a set of Mass vestments go threadbare and look really worn, then they must be replaced to be fit for the august service of the altar. So, if the images are really damaged or practically gone on your Purple Scapular, I'd suggest reparing them, or getting a new one. In fact, prevention is better than cure: cover the squares of your Scapular with clear plastic wrap of some kind if you can to prevent damage happening to the delicate details. To repair the paint part in front with the Passion symbols: print off a picture of the Purple Scapular, carefully cut out the symbols with a razor blade and use the print as a stencil, or if you're artistically inclined, do your best to paint them in by hand with a very tiny brush. For the back image: you could try taking the image of the Pietá into a place that prints T-shirts, etc, and have them print this on a T-shirt for you. 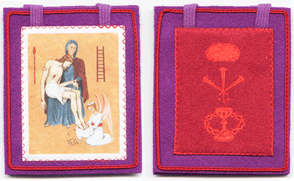 You can then cut out the image and sew it on to the Purple part of the Scapular if you want a cloth image. However, there is no stipulation saying this image has to be on cloth. You could print off a picture of the image (see picture above), have it laminated so it's protected, then sew it onto the purple cloth part. If the lamination is really thick and difficult to sew through, poke some hole in the corners and sew the picture on using a loop stitch. If the images had to be repaired, or a new strap put on, etc., I'd suggest having your Scapular re-blessed. Q: Is this meant to replace the Brown Scapular? Can I wear this INSTEAD of the Brown Scapular? A: ABSOLUTELY NOT! While there are many graces attached to the Purple Scapular, it is intended as a protection against the chastisements, a protection for churches against profanation, and graces of conversion are reserved for hardned souls and blasphemers, etc., but it does not have the absolute garauntee of saving you from Hell like the Brown Scapular, whish also has its unique set of graces of protection. In fact, the Brown Scapular is more imperative to give a peaceful assurance of salvation, that must come first, the Purple Scapular is intended for the those who wish to be protected on earth during the chastisements and who wish to be clothed as "Children of the Cross", and hopefully, sight of the Purple Scapular will convert those who happen to see it. Just be wise and wear both! Q: Do you know where I can buy them? Our Lord complained so few think upon the tears of His Mother shed during His Passion and the Scapular was to help people medidate on this. Here is another prayer you can say (please note it was not revealed to Marie-Julie Jahenny or forrmally revealed as part of the Purple Scapular), but still is beautiful. SHORT PRAYER TO THE MOST HOLY VIRGIN IN HER DESOLATION. His Holiness Pope Pius IX., by a decree of the S. Congr. of Indulgences, of Dec. 23, 1847, deigned to grant - An indulgence of 100 days to all the faithful, every time they say with contrite heart the following prayer in honour of the most holy Virgin in her desolation. So far, that's all the questions I have received or can think of. If there is something not answered here, leave your question in the comments and I'll do my best to answer it! Also, if you have received a miracle or grace through this Scapular, please share it in the comment section below! I am very grateful for this post.I have this scapular with me displayed in our house,but only today, that I read all benedictions attached.No wonder our home had been spared of any floods,lightning,fires,plagues,thieves,even our crops during previous supertyphoons.There is serenity in our house,that my children classmates wanted to visit frequently.Thank you merciful Saviour.May Marie Julie Jahenny keep us in her prayer and cover us with her merits during this perilous times.I love you my God and God bless this website abundantly. It says any Priest... Does this mean a Novis ORDO Priest can bless these items? Any Roman Catholic priest validly ordained in the Roman Catholic Church can bless the Scapular and the sacramentals. I do understand your concerns, however, despite what Marie-Julie Jahenny says about the 'New Mass' there are other revelations she was given that shows that Consecrations are still taking place despite the irreverance in some of these Masses, meaning, Novus Ordo priests still have valid orders. Also, take into account that there are N. Ordo exorcist priests to whom the demons must obey and are forced to leave their victims - demons will NOT obey anyone without valid orders, and they will NOT obey those priests who have not been given authority by the Church to cast them out. They very fact that the demons obey N. Ordo priests during exorcisms is evidence holy orders is still in place. It is the false ecumenical services without valid Consecrations we must be on guard against as Marie-Julie Jahenny warned, and the upcoming APOSTATE SCHISM which will resemble Islam, Arianism, or a combination of both. I have had people tell me of stories of conversion with the Purple Scapular, and they were from N. Order parishes, churches, etc. Do I personally believe the old Latin blessings are better regarding form, intention, etc, YES - but N. Order blessings are also valid.